Kadian first fell in love with Apple as a nine-year-old when he acquired his first iPod touch. He loved the aesthetics of this Apple product, its intuitive interface which allowed him to access a whole world of knowledge. He purchased his first MacBook Pro by shoveling snow and by selling his old train set, keyboard and other beloved items on Amazon. Kadian was renowned for his evangelical pursuit to convert everyone, even strangers, to Apple products. 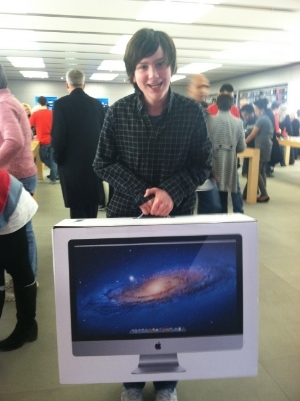 By fourteen, he had built an impressive amount of knowledge which never ceased to amaze the staff at Apple stores. 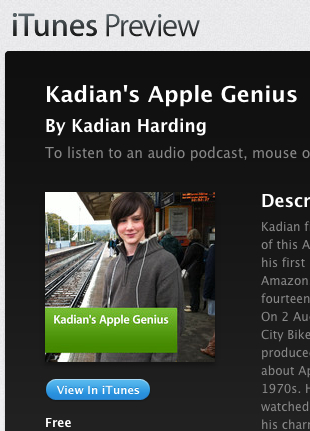 Starting June 2011 Kadian, then thirteen-years-old, produced 17 Apple product video podcasts. In one of his podcasts, 'iPhone 5 Predictions', he successfully predicted the key features of the new phone. In another of his podcasts, uploaded to YouTube, he has received over 6000 views. His knowledge was developed by watching every YouTube video by and about Apple, ­marketing releases, product presentations, magazines, documentaries­ going back all the way to the 1970s. His grasp of the fundamental vision that makes Apple so special was exceptional for his age. When we watched these videos after his death we were deeply moved to see all the characteristics of the Kadian that we knew: his charm, his confidence, his generosity, and his ability to relate to others. Kadian was equally in love with bicycles, the freedom that it gave him as well as the ability to interact with the wider world. On 2 August 2012, Kadian was due to fly to the USA where he had been hired to install 30 iMacs and a network for City Bikes at their their retail stores in Washington DC. A few weeks after Kadian died we contacted Apple about posting an in memoriam dedication on their website. They took a look at Kadian's fanboy tutorials and liked them so much that they created a dedicated iTunes site for him. Over the next few weeks we backed-up Kadian's computer and sent them to a technician who created an iTunes page. “Kadian’s iPhone 5 predictions showcase his remarkable intellect, in that he managed to decode Apple’s closely guarded new product development and nomenclature principles, to the extent that he accurately predicted outcomes, now proven with the launch of the iPhone 5." "And let’s be clear, that proves that, at 14, Kadian managed to see into the minds of highly talented design and marketing professionals behind one of the greatest brands on the planet. Recognising Kadian’s unique talent, Apple has taken the unprecedented step of creating a portal dedicated to his work on their iTunes Store global website. We can only wonder what Kadian would have contributed, had he been given more time with us. Such an individual flair for design and communications has never been so clear to me."